Media mogul Ted Turner is known for a lot of things: Founding CNN, a long marriage to actress Jane Fonda, and once proclaiming he wanted to buy so much land that he could ride his horse from Canada to Mexico without leaving his own property, among others. But did you know that once upon a time, he was in the Coast Guard? 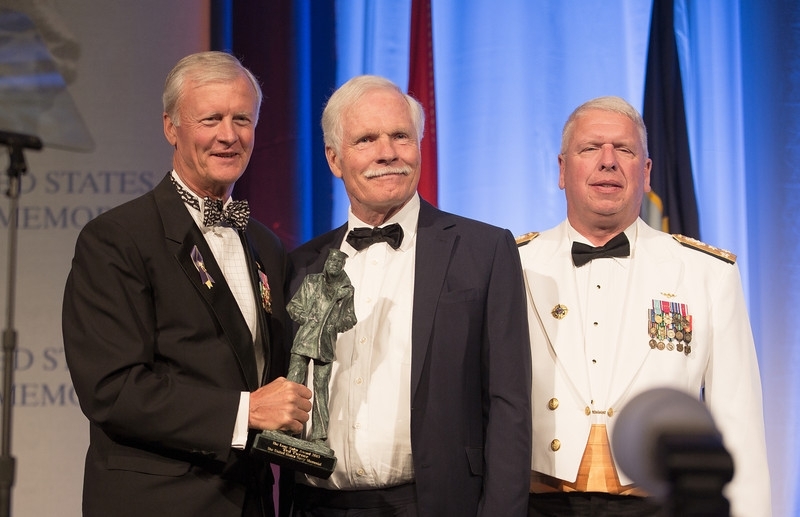 He was, and Wednesday night at the National Building Museum in Washington, D.C., the Navy Memorial presented him with the 2013 Lone Sailor Award. According to the Navy Memorial, the Lone Sailor Award is given to sea service veterans who have excelled with distinction in their civilian careers while exemplifying the Navy’s core values of honor, courage and commitment. Later in the evening, Turner told the Washington Post that in fact, he signed up 50 years ago because he had just been expelled from Brown University. According to a 2004 article in the Brown Daily Herald, the expulsion came after he was caught living with his girlfriend while on a second suspension for behavioral issues. No longer a student, he picked the Coast Guard to fulfill his draft obligation. “And I liked boats,” he said. Turner’s fellow Lone Sailor honorees included General Motors Chairman and CEO Dan Akerson and retired Gen. P.X. Kelley, a businessman and former Marine Corps commandant. Former Sen. Kay Bailey Hutchison, R-Texas, also was honored at the event, receiving the Naval Heritage Award, “an honor awarded to distinguished Americans who have given their unwavering support to this nation’s sea services and whose lives and careers also demonstrate the Navy’s core values,” according to a Navy Memorial news release. This guy went into the coast guard to fulfill his draft obligation. He did not have the honor of country to go in the Navy. He married Hanoy Jane. He only got this because he has and will continue to make tax deductable contributions. All this is just a money game and back slapping of the rich.